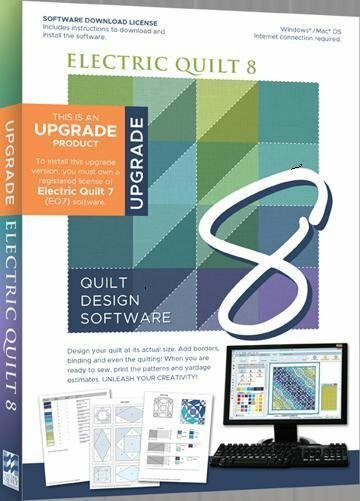 Electric Quilt is the industry’s go-to computer software for quilt designing. From professionals, to the everyday quilter, EQ has all the right tools and features for every designer. New Delivery: The EQ8 package contains a software download license. There is no CD, DVD or USB. There is a License ID and Password found in the package. This information will allow the purchaser to download the software from the EQ website. They will select either PC or Mac at the time of the download. The package also contains a 48-page booklet with complete instructions on how to claim the download on the EQ website, installation, activation, a starter lesson, quick tips and tools reference. **NOTE**This upgrade is for EQ7-users only!! !